Something fun for a hot summer day. This is one of my favorite dog portraits, a handsome and well-fed fellow sitting on one hip on what was called a “posing chair.” It was taken sometime around 1890. This pug looks a little different from the breed today. His nose is less squashed in and he can probably breathe a little better than than can pugs of today; his eyes are less bulgy, too. Since this photo is only 120 years old, you can see how quickly people have changed the breed through their selective breeding practices. But what I love about this photo is this dog’s serious gaze, despite the indignity of his belled collar. He’s a solid bourgeois citizen who happened to born in a dog suit, and he’s making the best of the circumstances. 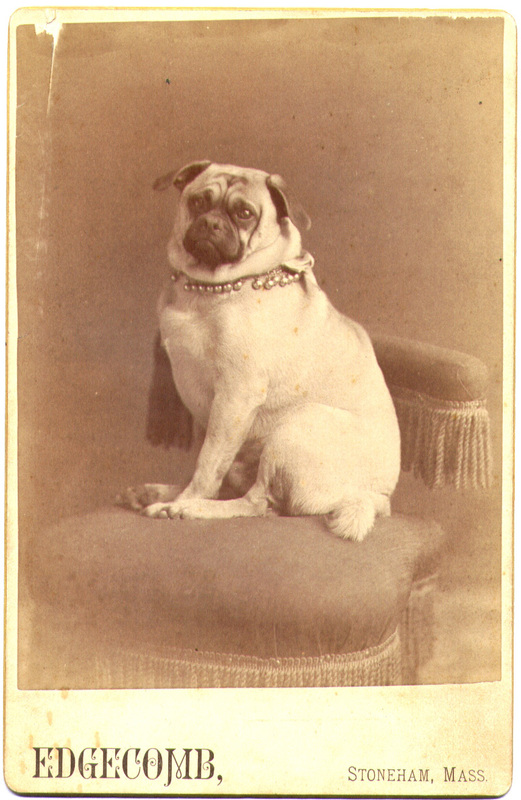 Portrait of an unidentified gentleman pug. Cabinet card, ca. 1890. Edgecomb photography studio, Stoneham, Massachusetts.